I logged on to write my photo Friday blog. I’ve got to say, I am numb. I feel sick. I have a million questions and I have been in tears multiple times while watching the news. I see my son wander unknowingly throughout our home, asking for a snack or a hug. All I can think of today are these Moms and Dads who lost their little ones today. Their babies who; like usual; sat down at their small desks to learn their ABCs and 123s. Most of those children in that small, primary colored classroom will not be going home tonight. As humans we generally band together in situations like these. We feel heartache even though we are all strangers and we live hundred of miles apart. We are born with an innate quality to protect and most of us would give our life to save a child. What a senseless, sick tragedy. I can not help but think of the family of the shooter(s). The news states that he was a troubled and disturbed twenty year-old and had a plan to kill his mother, who was the kindergarten teacher at the school. This must have been one troubled young man. As a parent it would be difficult not to blame yourself. Wondering if their was anything you could have done. All in all, today we are shaken. So much sadness, so much sickness in the world. The only thing that brings some peace to my heart today, is that this is not our home. There is a song called, “This is my Temporary Home.” I am reminded of it today. It always brings tears to my eyes because it talks of a child who is 6. He does not have a family and is moved around foster homes. But, he explains that he is not afraid because earth is just his temporary home. These babies that passed away today are with the Lord, no pain and no fear. It is the people who are left behind that are in immense amounts of pain and suffering. They need our prayers. As I was sitting down to write this today, I noticed a friend on Facebook who shared another’s status. He shared much of the same sentiment that I was feeling today in a very beautiful manner. He included a verse, it was more than appropriate. In some ways today my gratitude list seems selfish, for so many this day will always be remembered as horrific. So I will keep it short, and the items on the list will most likely be shared with many of you, especially in light of what has happened. Give extra hugs and kisses to your babies tonight. former things are passed away. This photo is by no means picture perfect, quality wise. I had someone else take the photo, they were not quite sure how to use the camara. But I love it none the less. The reason? When I was young my Dad and I had craft Sunday every week. I have always loved doing crafts and my Dad is and always has been creative. and homemade pop-up cards. Searching the library for our next craft project and visiting the local craft store to gather our supplies. Our projects have obviously increased in size and complication. The time spent together is still treasured. vision come to reality. I cannot wait to share the final look with you! She is clothed in strength and diginity and she laughs without fear of the future. more beautiful than you ever imagined. Not much has been going on around here. We have just been spending time at home, together. Home, not many places better. Again, me with the definitions. Home a. An environment offering security and happiness. In general our home offers this. A secure place to share yourself, ugly parts and all. To hold hands when we are scared and be sad when our hearts are broken. A place for me to bawl my eyes out while watching an emotional movie (have you seen October Baby?). A place where we can stay in our PJs all day if we so desire. To share secrets with a best friend on our big, comfy couch. A private dance hall for Gray and I to dance every afternoon in our living room. A happy place to share exciting news and the goings on of our day. To celebrate Grays tiny victories, like counting to three or praise for finishing his dinner. To discus our dreams and hopes for the future. A place to share with family, have I mentioned that we have an amazing family? We are so blessed to have a whole bunch of family that love us like mad. Our home already has so many memories and I do feel secure and happy here. But I realize that the security and happiness I feel is so much bigger than the structure of our home. That comes from whom I am blessed to share my home with, who I am blessed to have visit our home. The type of atmosphere we allow and encourage in our home. I look at our home as a shell that we fill up. We furnish and decorate, we may tear down walls and repaint. We fill it with laughter and tears, with goals and accomplishments. We decide who we want to share our home with. We are just like that shell. As human beings we have the unique opportunity to fill this shell. To decide what we put inside, to make an environment that offers security and happiness. What are you going to fill up with? Anyone who knows me, knows that I talk a lot. What they may not know is that I have many different reasons for talking a lot. Most often I chatter away because I have a lot to say and the particular topic interests me. But coming in at a close second my reason for constant chit chat is to mask the fact that I am nervous, uncomfortable or worried. I talk a lot when I am uncomfortable. That may sound weird to some but when uneasy, I talk and talk and talk. A nervous thing I suppose. I talk a lot when I am worried. I drive my dear Mom crazy! I ask her a billion questions about the same thing over and over. Now where is all this chatter leading us to? Well, the truth is; I am shamed to admit it; there is not a thing that I don’t worry about. Honest, one of my biggest pitfalls. This is what is going on in my head right now: Do I look ok, will they like me? Do they like me? Will I like them? Will I get pregnant again? Will it be fast? Will Gray stop nursing if I am pregnant? Will he be ok? Will he feel abandoned? Will we have a safe vacation? Will we have enough money for retirement? Will Gray be able to go to college? Is Hubs going to win his frisbee game tonight? Is Gray sick? I think he might be. My Mom was babysitting this week and she was pretty sick. My teeth hurt. Oh no, will I have to get a root canal? Please no root canal! Oh man, what am I going to make for dinner? See!? Being in my head is exhausting. I simply wrote exactly what I was thinking about, at the exact moment I was thinking it. That was literally three minutes in my head. And the sad part is, those things, trivial. Trivial compared to things that others worry about that actually matter. Plus my worries don’t change a thing. They are a waste of my time and energy. Well you know what? I have good news. God can handle all of it. Yep every single one of my worries. Do you worry too? Good news for you too then. God has got it! If you were a fly on my wall several times a day, you would here me cry out, “take it Lord, I can’t handle it!” And He does. Because as you can see I got a lot going on in my small noggin, I would run out of room if I did not give it away! Nope, no perfection over here. Only a work in progress. Thank goodness for grace. What does God have to say about worry? 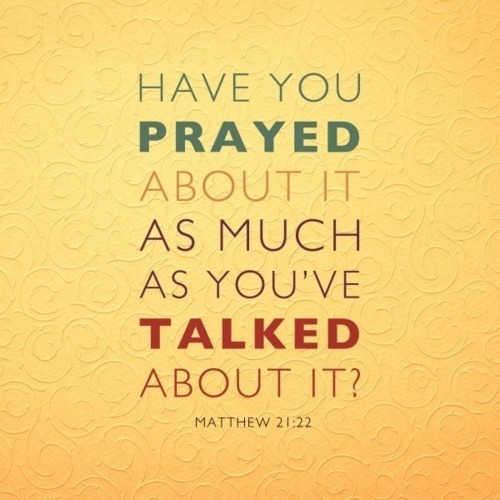 Pray about it. Ask Him to help you. Give it all to Him, because He loves you. What happens when we trust God with our worries? Peace. Hope you have a wonderful and worry-free week.